The 2016 Washington Redskins season is the franchise's 84th season in the National Football League and the third under head coach Jay Gruden. The Redskins are the defending NFC East champions from the previous year. All 2015 contracts expired to coincide with the beginning of the 2016 NFL League Year at 4:00 EDT on March 9, 2016. However, before that date, all teams had until March 1 to place the franchise tag on a player, and could begin negotiations with a player's agent on March 7. On March 8, the Redskins released S Dashon Goldson, DE Jason Hatcher, QB Robert Griffin III, and S Jeron Johnson. On April 14, the Redskins waived OLB Jackson Jeffcoat. The 2016 NFL Draft occurred from April 28 to April 30, 2016. 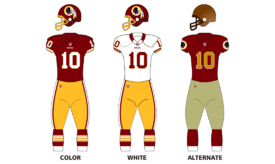 Going into the draft, the Redskins had eight selections, two of which were from another team: the additional seventh-round (#232) selection from the Dashon Goldson trade in 2015 and a sixth-round selection (#187) from the New Orleans Saints (the Redskins sent their sixth-round selection to Tampa Bay as part of the Goldson trade). During the draft, the Redskins swapped first-round selections (#21 for #22) with the Houston Texans in exchange for their 2017 sixth-round selection, traded their 2016 fourth round selection (#120) to the New Orleans Saints in exchange for the Saints' fifth-round selections in 2016 (#152) and 2017, and traded their fifth-round selection (#158) to the New York Jets in exchange for their 2017 fourth-round selection. † Indicates the game will be simulcast on WJLA-TV. The Redskins entered this Week 1 matchup against the Steelers having lost 5 consecutive games against Pittsburgh dating back to 1991. They scored an average of 8.2 points per game in those five losses. Redskins 22 point defeat was their worst in a Week 1 game in 15 years. It was also their worst opening day home loss since 1966. The Redskins defense had a very hard time containing DeAngelo Williams as he exploded for 143 rushing yards and the Steelers explosive receiving corps of Antonio Brown and Eli Rodgers who would go on to have strong performances. With the win, the Redskins improved 1-2 and won at MetLife Stadium for the first time since 2011. The Redskins rallied with a late touchdown run by Cousins, but the Lions responded with Matthew Stafford throwing the game winner to Anquan Boldin, therefore ending the Redskins winning streak. Hoping to rebound from their loss to the Detroit Lions, the Redskins played in the third and final game of the year in London against the Cincinnati Bengals. With a few minutes left in overtime, Dustin Hopkins missed a game winning field goal and allowed the Bengals to take over. After that, Bengals' Andy Dalton fumbled and allowed the Redskins to take back the ball. A Hail Mary attempt failed, making the Redskins tie for the first time since 1997 when they tied 7–7 against the Giants. After their tie against the Bengals and their bye week, the Redskins came back home to host the Minnesota Vikings on Homecoming Weekend. After allowing the Vikings to score 20 unanswered points to end the first half, the Redskins shut out the Vikings 12-0 in the second half, improving to 5-3-1 on the season. The Redskins avenged their 36-18 loss to the Packers in last season's Wild Card Playoff by beating them 42-24. An attempted rally by the offense did not pay off. The Redskins dropped 6-4-1 and were swept by the Dallas Cowboys for the first time since 2013. ↑ The Week 4 preseason game against the Tampa Bay Buccaneers at Raymond James Stadium, originally scheduled for September 1, was moved forward to Wednesday, August 31, in an effort to avoid anticipated severe weather from Tropical Depression Nine. ↑ "Redskins Sign 14 College Free Agents". www.redskins.com. Retrieved 2016-05-07. ↑ "Buccaneers-Redskins Preseason Game Moved to Wednesday Night". Tampa Bay Buccaneers. August 29, 2016. Retrieved August 29, 2016. Wikimedia Commons has media related to 2016 Washington Redskins season.